The following five officers have been empanelled as secretary equivalent. Promotion has not much to do with brilliancy or honesty alone. Haven't we seen how many of our imp secretaries are ? Earlier home, foreign etc to name a few . System promotes status quioist . IFS hve already been empanelled as secretaries and many critical mission heads are already at apex scale ie secretary GoI. Mr VP Baligar became a victim of a section of IAS and IPS in Karnataka against who he took action a few years ago, our sources say. A case was filed against him which Karnataka High Court quashed on October 11, but by then the damage was done. 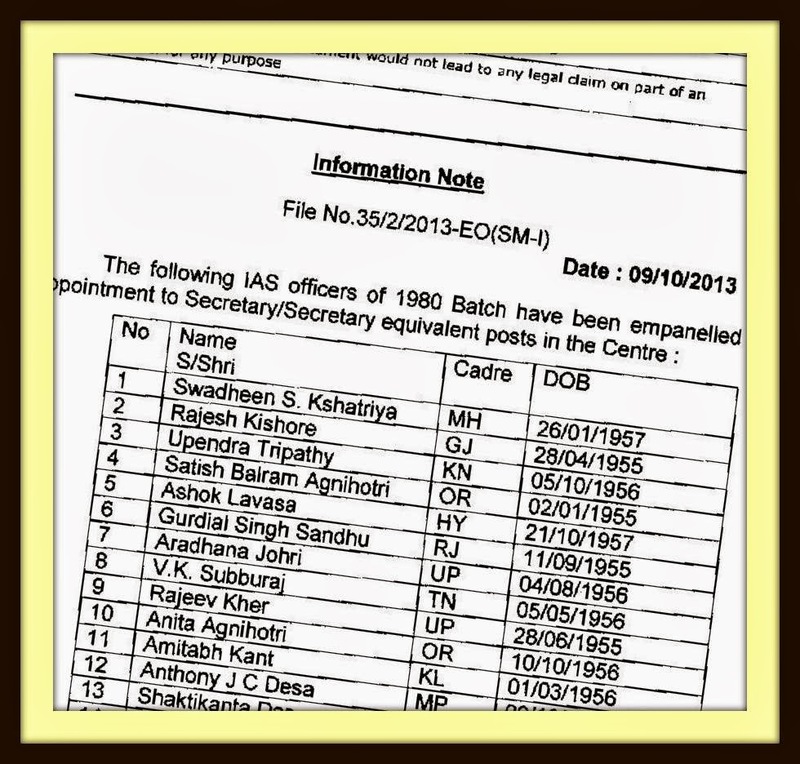 The empanelment list of 1980 batch IAS came out on October 9, two days before his case was quashed. It's expected that the name of Mr Baligar, one of the senior most in his batch, would come up in the second list. If a bureaucrat is honest but tough task master, the current trend is to fix him/her by any means, including the use of RTI, moving the court etc. Baligar's date of birth is 6th Nov 1964. So he will complete 60 years on 6th Nov 2014. A few months after empanelment, those empaneled are promoted to Special Secy rank in situ, but they continue to do same work. Then as Secretary vacancies arise, they are posted to Secretary posts. Baligar will have less than one year as Secretary before retirement. 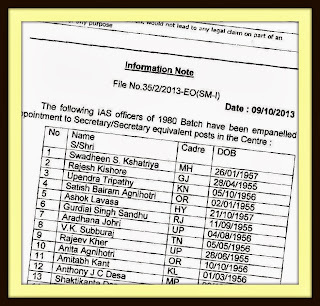 We are surprised to find that the name of Dr Anoop Pujari is not in the list of officers of 1980 batch, empanelled as Secretary to Government of India. Whether it is efficiency, honesty or integrity, there can not be any finger raised against him. In fact he must be among the very few officers, who are (a) very accessible (returns all calls, responds to all emails, meets every one in office), (b) very positive attitude (seeks to solve problems posed to him, rather than find ways to say "no"); (c) maintains an austere life style (drives a scooter in private life; does not use air-conditioner in office in summer and heater in winter, travels economy class, stays at government guest houses and not in hotels) and (d) finally calls a spade a spade (does not mince words in stating his position and offering his views). Obviously some bosses may not find this palatable. If he is not found fit for promotion then what can be said of the system. Dr Pujari has an unblemished record both at Government of Karnataka and at Government of India. He was Joint Secretary in Economic Affairs for 4 years and now for last 3 years he has been Director General of Foreign Trade DGFT. How sad that we can trust him with the Country's exports but not find him good enough to be a Secretary. One small story about him. He must be the only officer in such an important post who refuses to take any gift, no matter who comes with a ggift. Even flowers are not welcome in his office (at his home there is no permission even to see him, what to speak of leaving a gift). His standard response is do not give flower bouquets, if you wish to spend money, spend on books. Now that the garland of empanellment eludes him, Government has consigned him to his books only, perhaps it may suit him, he being an academic. How unfortunate. Agreed. He was instrumental in bringing about a sea change in the way DGFT functions in the last few years (and he continues). Some of the e-initiatives such as usage of emails for all official communications, e-BRC, simplification of procedures, effect of notifications etc were ushered in during his time. DGFT offices became one of the most e-friendly offices during his tenure. His past performance has been equally good. It's a loss to GoI that he is not figuring in the list. Chalta hai..Dr Pujari is not a North Indian, even as he is fluent in Hindi and is a Delhite. He saved India's plummetting exports, from a huge negative figures we have 13 percent plus in dollar terms for four months in succession. Let somebody show this performance...We need doers not doormats..